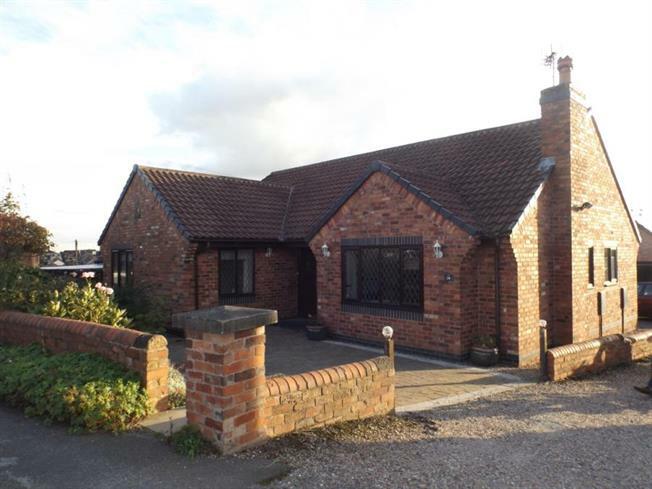 3 Bedroom Detached Bungalow For Sale in Chesterfield for Guide Price £250,000. Situated in a popular village location this well maintained and presented bungalow offers family sized accommodation. Having Reception Hall, Lounge Diner, Breakfast Kitchen and Utility Room. Three Bedrooms, the Master having En-Suite, Bedroom 4/Dining room and family Bathroom. Outside are gardens to the front and rear, driveway and Garage. Viewing Essential. This spacious reception hall has radiator, double cloaks cupbard providing storage space and further inner hallway leading to the Bedrooms. Two piece suite comprising of low flush wc and wash hand basin. Tile splash backs, raditaor and extractor. Fitted with a range of wall units including a glazed display cabinet, base units with work surfaces over incorporating a single drainer sink unit. Integrated four ring gas hob and gas oven with extractor hood over. Integrated dishwasher, fridge and freezer. Tile splash backs, breafast bar and windows to the rear and side elevations. Having single drainer stainless steel sink unit, plumbing for the automatic washing machine and radiator. Wall mounted Worcester gas heating boiler and entrance door to the rear. The second measurment excludes the bay window which overlooks the front elevation. The focal point of this room is a feature Adam style fire surround incorporating a living flame coal effect gas fire. Further window to the side, television point, radiator and ceiling coving. Upvc double glazed french style door over looking the rear and radiator. The first measuement has been taken to the front of the three double fitted wardrobes which providing shelving and hanging space. Laminate floor and access to the availalble roof space. Three piece suite comprising of corner bath, vanity unit and low flush wc. Tiled walls and floor, expleair and radiator. Three piece suie comprising of double shower cubicle, pedestal wash hand basin and low flush wc. Radiator, half tile splash backs and window to the side. The front of the property has walled frontage which a variety of shrubs, the front has been block paved for easy maintanence and to provide vehcile standing space. The side shared driveway in turn leads to the rear garden which is a particular feature being laid to lawn with patio area. The rear garden also provide vehicle standing space and hardstanding for a small motor home/caravan. The rear garden has detached garage with up and over door and entrance door to the side.